And yet, Bernie's campaign had to plead guilty to collusion, has anyone else from the 2016 Presidential run? How about the other scandals I mentioned and sourced in my comment? Or are you only concerned about trying to discredit ONE of the stories I mentioned? If the DNC tries a Biden/Clinton ticket, they just opened the doors to one of the worst campaigns ever run, exceeding the 2016 fiasco. After four years of unsuccessfully running a campaign of destruction against Trump over his "misogyny," then to run "Creepy Uncle Joe" with the roaming hands, and to have the "Champion of Women Everywhere" Clinton standing beside and urging him on? The Republicans could not write a better campaign strategy if they started with a blank slate and a fictional character designed specifically to lose. I agree, and yet, they are probably just that ignorant of the reasons they lost, that they may just try this crap again. Their reasoning? Well, Hillary won the popular vote! I'm pretty much Independent, with fiscal conservative views, and liberal social views. Meaning, I like smaller government, and for them to stay out of our beeswax, but I'm OK with folks' rights to have abortions, equality for lgbt, etc. (this does NOT translate to the military....serving is not a RIGHT, it's a specialized JOB that his rigorous demands to benefit the military, not social sensibilities).....I'm also pro-gun, because I believe the reason our founding fathers put that in, was to be the ultimate check and balance, in a system of checks and balances. If the Dems can produce a decent enough candidate without a trail of bodies, rigged elections, traitorous activity, etc., I'll be happy to vote for them instead of Trump. Biden is safe there, but like you mentioned, the handsy thing will cost him votes. Note, that while I'm for the "right" of folks to have an abortion, I would never choose this option for MY child. While I do not feel it right to deny this choice for others, for myself and my family, I would prefer the child be carried to term, and then if not able to raise him/her, put the baby up for adoption. It would not overly surprise me if that actually happened. Too stupid to learn from their previous idiocy. For the love of God, though that may be asking a lot, Democrats, look around you, there are a plethora of new young(er) faces out there you should be pushing to the forefront of the party. Faces that would appeal to the more moderate (myself, as an example) in the party. Instead, you're going to run some old retread, who's only moments away from needing a bib and a drool cup. Or some old dude with roaming hands. Or some old dude who rolled over and showed his throat when he was still a viable, though barely, candidate. How many more state houses, governors mansions, and Congressional seats do we need to lose before you in the DNC, and the grassroots, catch half a clue? We can't claim, any longer, to be the party of Kennedy, either of 'em. I didn't know Jack or Bobby Kennedy, but I know what they stood for, this ain't it--not any more. I'm independent myself, proudly so, fiscally conservative and moderate socially. I'd have no issue with voting for a Democrat provided that Democrat can show me they'll push for less corruption, get the government off the backs of the people, and quit giving away the country. That's why I voted for Trump, not because he joined a particular party. Now, though, every time I hear the politics of personal destruction leveled at him, I feel like it's leveled at me too... because he's doing pretty much what I wanted him to do. That feeling is becoming cemented in my mind as a Democratic trait, which is a pretty big hill to climb come election day. Add to that, the last time I voted Democrat (2008), I was still accused over and over of being "racist" despite voting for the black guy! The use of any such derogatory label towards anyone now makes me back away from the candidate (or party) using it. In hindsight, Hillary partially blamed herself for just 1 day. She quickly returned to her usual self. 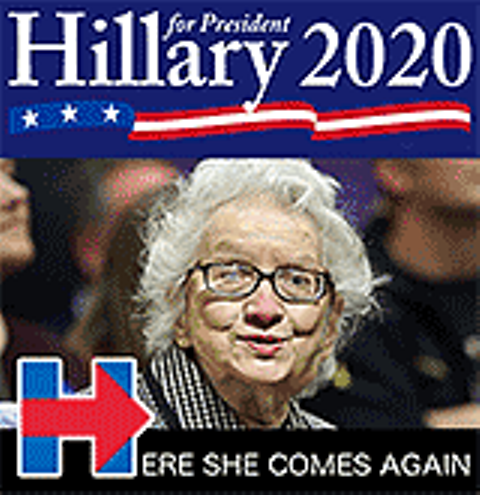 Aside from Joe Biden, there doesn't seem to be any other reputable Democrats on the horizon for 2020. So it looks like Hillary is intentionally staying in the public eye, in case nobody better comes along. I'm sure Hillary feels that there is NOONE better.